Ruapehu dominates the North Island’s central plateau. Its great bulk is visible in the distance across much of the North Island. Crossing the state highway bridge at Wanganui, for example, it forms a surprising climax to the view upriver. On a clear day, the mountain can even be seen from the South Island. Remember that you are on an active volcano. Eruptions large enough to be hazardous to people within the active crater basin (within the circle of Dome, Paretetaitonga and Tahurangi) have a return period of about 10 years. Outside the crater basin the return period is about 20 years. In the last 60 years, a signiﬁcant proportion of these eruptions have occurred more or less without warning (so called ‘blue sky’ eruptions). Lahars (volcanic mudﬂows) can ﬂow down any of the major valleys during major eruptions, although only down the Whangaehu valley in smaller ones. If an eruption occurs, get out of the valley ﬂoors immediately. As a general rule, Whakapapa is the best place to access northern and western routes; Turoa the western and southern routes; and Tukino the southern and eastern routes. All the same, many routes, especially those that start from the Summit Plateau or Crater Lake areas, are accessible from all three major road-ends. 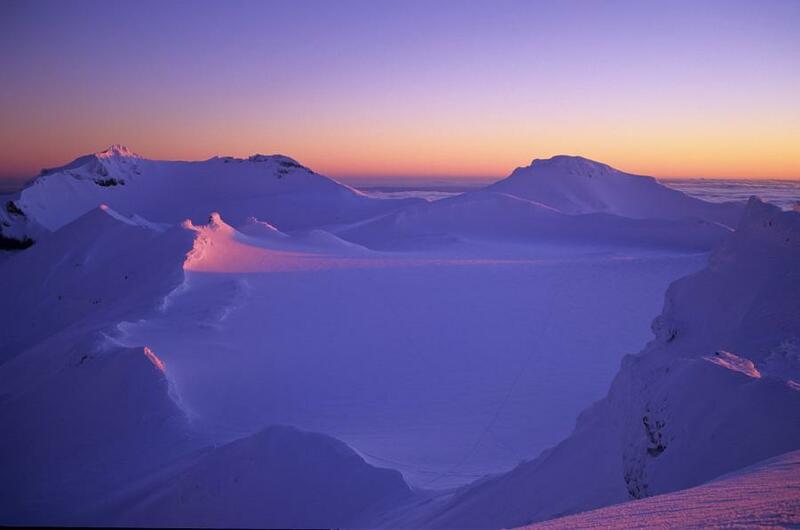 The easiest way to access the Summit Plateau and Crater Lake is from the Whakapapa ski area. This is the most popular way to access the Summit Plateau and Crater Lake. Until well into summer, most years, snow blankets the upper mountain. But by autumn the steaming Crater Lake is ringed by stark burnt-orange rocks and dark, ash-covered snowﬁelds – dramatic evidence that the volcano is a restless environment, a place not quite of this world. Although one-way lift tickets up the skiﬁeld are available in winter, and during the summer holiday period, ﬁrst-time visitors may want to walk, if only to gain a better idea of the topography of the mountain: it is not that straightforward. In summer, guided walks begin from the top of the skiﬁeld chairlifts, up a scoria track to the Crater Lake. In winter, the short climb to the Summit Plateau from the Whakapapa skiﬁeld is many North Islanders’ ﬁrst true alpine experience. From the carpark you can reach the vicinity of the NZAC Ruapehu Hut in about 90 minutes. Follow Tennents Valley to Hut Flat, and then a poled route climbs up Egmont Ridge behind (west of) the Ruapehu Ski Club lodges onto the western side of Delta Ridge. The hut is on the brow of this ridge at 2040m elevation (grid ref 310138). From here there are two main routes. Note that parts of both routes lie in paths followed by lahars on the three occasions they have been recorded on this side of the mountain. Two of these, in 1969 and 1975, occurred in ‘blue sky’ eruptions. From Delta Corner (the rocky end of Delta Ridge) it’s about another 90 minutes to Glacier Knob. Climb up ‘The Gut’ – a popular ski gully between Knoll Ridge and Restful Ridge – and continue beyond straight up the broad valley to the obvious knob on the skyline. Alternatively, just before the top sidle up and slightly to the climber’s left (east) to reach The Notch. This gives direct access to the Summit Plateau. In winter, watch for snow loading from the westerly quarter. From Glacier Knob it’s worth going south along the ridge to The Dome at 2672m. Here you overlook Crater Lake, and beyond is Tahurangi, the true summit of Ruapehu. Dome Shelter is a small emergency shelter, not intended for overnight use, on top of The Dome at grid ref 313113. During winter the door is often buried by snow and ice, so there is a hatch in the roof for emergency access. This shelter will be removed ‘when it falls due for replacement’. Check with DoC on its current status. From the carpark you can reach the vicinity of the NZAC Ruapehu Hut in about 90 minutes. Follow Tennents Valley to Hut Flat, and then a poled route climbs up Egmont Ridge behind (west of) the Ruapehu Ski Club lodges onto the western side of Delta Ridge. The hut is on the brow of this ridge at 2040m elevation (grid ref 310138). From here there are two main routes. Note that parts of both routes lie in paths followed by lahars on the three occasions they have been recorded on this side of the mountain. Two of these, in 1969 and 1975, occurred in ‘blue sky’ eruptions. From Delta Corner climb to the south-west, through the ‘Cornice Bowl’ to reach the top of the Far West T-bar (300m climb, about 45 minutes). From here, continue up the wide valley to reach The Col between The Dome and Paretetaitonga (a further 300m, another 45 minutes). It is a short climb from the Col to the Dome, best made by continuing around underneath and then back up the eastern ridge. In poor visibility the Glacier Knob route is a better descent; when descending the Whakapapa Glacier care needs to be taken to head north-northeast so as to regain the skiﬁeld. Failure to do this will leave you amidst the exposed bluﬀs of the upper Whakapapaiti valley – a long long way from anywhere. The Whakapapa Glacier formerly ﬁlled the upper reaches of the valley leading to The Col. Fifty years ago, on April 2, 1954, crevasses across the upper glacier forced Tom and Doris Barcham hard under Paretetaitonga, and then under the Dome to traverse Pyramid. Finally, on Tahurangi they met ‘very steep hard compacted ash. Cut many steps!’ Earlier that same year, New Zealand Canoeing Association members carried a rubber dingy up to explore Crater Lake. Although people have swum in the lake, with a fairly constant acidity of pH 1 this cannot be recommended. There is a story, possibly apocryphal, about a boat once kept near the crater for research purposes. Over time, the acidity ate away at the nails holding the craft together until on one fateful voyage . . .
From the end of the Ohakune Mountain Road, walk up the skiﬁeld cat track, and make your way up to the top of the Jumbo T-bar at 2200m. One-way lift tickets are not available on this side of the mountain. From here, leave the skiﬁeld boundary and climb in a northerly direction on a rising traverse aiming for a broad ridge at about 2350m. Continue on a rising traverse around the mountain, over rough scree by late summer, into the Mangaturuturu Glacier basin. Climb up to Pare Col at the head of the snowﬁeld, overlooking Crater Lake. From the Tukino skifield carpark at 1700m, climb the rocky spur south of the upper rope tow. Avoid the gully on your left (south) at all costs; it can harbour a significant avalanche hazard. A poled route leads up in a westerly direction, past a large lava outcrop (the ‘Luncheon Rock’) and crossing several gullies, to a prominent marker pole at 2150m. From the marker pole, the NZAC Whangaehu Hut can be seen about 100m below to the south, perched on a spectacular bluff above the Whangaehu River. Pick a traverse line across and onto the lower Whangaehu Glacier. Take care here: these slopes can get very icy and the runouts are not good. In good snow conditions it’s possible to keep fairly high, but it may be necessary to descend to about 2100m and then climb across and down into the valley. Once on the glacier it’s a long, steady climb up the gently convex slope. From the Tukino skifield carpark at 1700m, climb the rocky spur south of the upper rope tow. Avoid the gully on your left (south) at all costs; it can harbour a significant avalanche hazard. A poled route leads up in a westerly direction, past a large lava outcrop (the ‘Luncheon Rock’) and crossing several gullies, to a prominent marker pole at 2150m. From the marker pole, the NZAC Whangaehu Hut can be seen about 100m below to the south, perched on a spectacular bluff above the Whangaehu River. From the marker pole, take a rising traverse north-west. The most direct route is to aim for Button’s Buttress, the large bluff on the south side of the glacier proper, and then climb up a wide snow gully to reach the Summit Plateau north of Matihao.